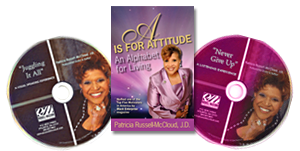 Best Selling Author and Acclaimed Orator for over 30 years, Pat Russell-McCloud, J.D. offers a new journal book entitled, “My Journal: Myself, Inside Out.” With this new publication, Pat encourages her readers for 365 days as she offers inspirational messages and self-help techniques. Each page includes Pat’s own words, as well as space for the reader to explore their own thoughts and write them down. “I want this journal to become personal, private and important for everyone who purchases the journal as a gift or for themselves. I want them to explore their own lives and make the sometimes difficult choices that hold them back from their greatness. I’m only creating the path for this to occur,” states Russell-McCloud, J.D. The Journal will be published in hard cover with a beautiful leather-look material and silver lettering. It is truly an item to be cherished by you, women close to you and the women who represent the generation coming. And for every man who cares about the well being of all of the women in his life, this journal is a perfect selection. A IS FOR ATTITUDE: An Alphabet for Living. This touchstone for contemporary living teaches the reader to assess their strengths and weaknesses to maximize their potential. This book, chapter by chapter, is chocked full with anecdotes, advice and action steps, as it provides a blueprint for a successful life that has meaning and substance — NOW. In addition to helping readers tap into their potential, A IS FOR ATTITUDE shows how to effectively make use of their time through organization and preparation; how taking risks reaps rewards, that "will enhance every aspect of your life." Packed with anecdotes, advice and action steps, A IS FOR ATTITUDE brings readers twenty-six inspiration-filled chapters that form a blueprint for better living. It offers a visionary approach, inspiring readers to reach their highest potential. Audio CD by Patricia Russell-McCloud, J.D. NEVER GIVE UP! — CD — presents 11 cuts on various topics of encouragement and empowerment. The listener is urged to positively respond to what they must do as an individual to be their best. When disappointment comes, and it will, they must be committed to the fact that they have as a mantra to Never give up! If you want to laugh, make some plans. Look at your life story. You have demonstrated ability and fortitude. You have the commitment and stick-to-itiveness that is enhanced by the title message of this listening experience. "NEVER GIVE UP!" DVD by Patricia Russell-McCloud, J.D. Juggling It All — Video of a mesmerizing performance before 4,000 women at the San Francisco, CA Conference for women. Pat celebrates group for all that they accomplish on a daily basis as true unheralded "sheroes". Motivational, inspirational, and instructional as Pat points out that women often have the necessity of reaching beyond their grasp, trying when they are weary, and seeking to do more with less. Through it all, they excel and make it all happen. A IS FOR ATTITUDE, NEVER GIVE UP, and Juggling It All — Buy this Power Pack and get all three resources.